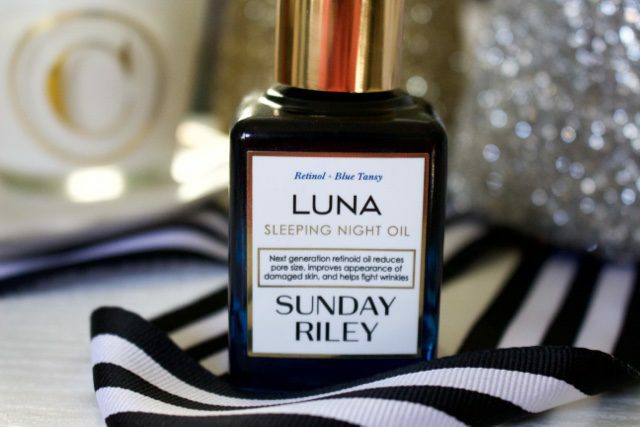 I can’t believe I haven’t posted about the Sunday Riley LUNA Sleeping Night Oil before. Honestly, I thought I had because I’ve talked about it on Social Media so many times that I had to go look on the blog and double check that I had indeed NOT posted about it. CRAZY! Sunday Riley has become quite a popular name here in the US I’d say. Especially this year. I’ve tried several of her products and for the most part, I’ve loved them all. The only acceptation is the Good Genes, which at times, doesn’t agree with my sensitive skin. However, LUNA and I get along just fine. The only thing we don’t agree on? That price tag is super high, but I’ll get into that later on. 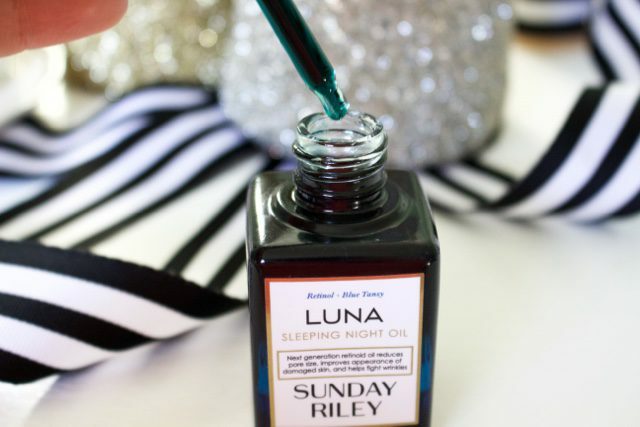 This Sunday Riley Nighttime Sleeping Oil has been all over Blogs, YouTube and Social Media. It really just took off and BAM! It was one of those products that everyone was talking about. I had previously been using her JUNO Oil and while I did enjoy it, it wasn’t giving me the results that I was hoping it would deliver. My main concerns? Enlarged Pores, Inflamed Skin, and Anti-Aging. So I jumped on the LUNA bandwagon and decided to give it a go. My results were incredible. 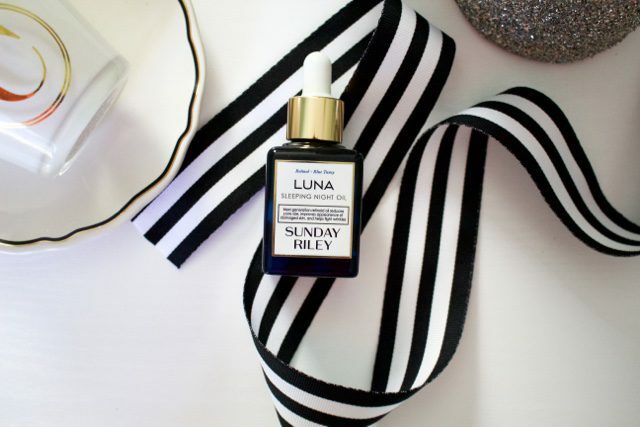 The Sunday Riley LUNA Sleeping Night Oil contains some very impressive ingredients, as well as some that leave me a little puzzled. One of the highlights of this product is the Trans-Retinol Ester (Hydroxypinacolone Retinoate), which is basically an advanced retinol complex. If you have sensitive skin like I do and can’t handle retinol normally, this might be a good option for you because they’ve included additional ingredients to help calm the skin (Blue Tansy and German Chamomile). Other notable ingredients are the Organic, Cold-Pressed Oils like Avocado, Grape Seed, Blackberry and Chia Seed Oils. Also included (these are the ingredients that have me a little puzzled) are several Citrus Essential Oils. Neroli, Blood Orange, Ylang Ylang and Vetiver are all very fragrant Essential Oils. If you have any sensitivity to these previously, I’d use this product with caution. “This product is blue! Will I look like a Smurf after I apply it?” Good question. The Blue tint comes from a combination of the Blue Tansy and the German Chamomile, however, there are also Synthetic Colorings (Green 6 and Violet 2) included. You will not have blue skin, but it does take a little bit to sink into the skin. If you’re noticing it still on your face, you’re using too much. “Does this smell?” Call me the oddball, but I happen to appreciate the Facial Oils that most people do not enjoy. Honestly, this scent doesn’t bother me at all, however, like I said above, if you are sensitive to scents I would highly recommend getting a sample of this or getting yourself to a Sephora store to smell it. “Can I use this with my other Retinol that I’ve been using?” I’d say no. I don’t see that is necessary and might be too aggressive on your skin! Also, I don’t use any other AHA’s or any other Chemical Exfoliants when using this at night. Overall, I’m actually really impressed with this newest product from Sunday Riley. This is a great introduction to a Vitamin A product and very gentle at that. The Blue Tansy is so gentle and helps calm the skin from any unwanted irritation or inflammation. It’s helped improve my pore size tremendously and I’ve noticed that my skin sees to be much brighter and even. On nights that I haven’t used this, I’ve noticed that my skin just doesn’t have that glow and my pores seem way more noticeable. This has wonderful Anti-Aging, Anti-Irritant, Moisturizing properties. You’re getting some fantastic ingredients, but you’re paying for them as well. At $105.00 a bottle, you’re going to have to save your pennies for it, but I think it’s worth it. Similar products? Yes, I’d say Paula’s Choice 1% Retinol and a variety of other brands that carry retinol such as SkinCeuticals, BUT they might be a little bit more harsh on the skin than the LUNA Oil, as I’ve found it to be effective, but so very gentle. If you’re already using a retinol product, this might not pack as much of a punch as you’re used to. I love LUNA for a variety of skin types, but I think overall, it’s a great introduction to a retinol that isn’t as harsh. -PM USE! Cleanse, Tone, LUNA and a Moisturizer. I just apply about three to four drops. Gently apply it to the skin, by pressing it into the skin gently! This does take a bit to sink into the skin, so give it some time before moisturizing. Overall, while there are some cons to consider, I have nothing but positives to say about this product. If you can handle such a steep price tag, I’d suggest giving it a try. I want to note that I paid for this, this was not a product sent to me for review. So I get the high price tag being an issue! This oil is a great introduction to the whole Retinol craze, which is a good craze to be a part of. The Anti-Aging and other benefits of using a product like this can be amazing to the skin! 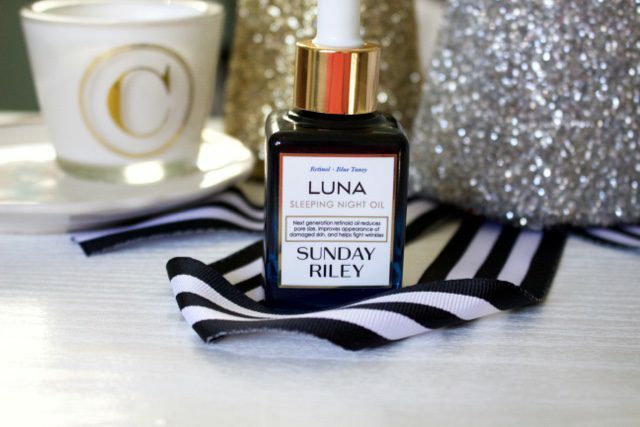 I think the Sunday Riley LUNA Sleeping Night Oil is a product that deserves its hype. Just use it consistently and I think you’ll love the results that you’re seeing! A nighttime sleeping oil that helps with fine lines, pores and inflammation? Seems to good to be true, but it's just as magical as it sounds!